Calling card for E. A. Pinnock. Unfortunately, I have no further clues as to the gender of this person or his or her location. Worse, I'm not even sure that the first initial is an "E". It happens that the calling card was acquired in Maine, but that may or may not be a clue. 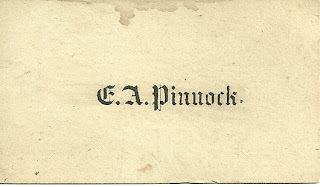 Researching online, I found an Eliza A. Pinnock in Parsonsfield, York County, Maine. Eliza was born about 1825 according to an 1850 Census. If you have any insights into the person named above, please contact me.